The charismatic nature of the Church has been present since the beginning when the Holy Spirit came on Pentecost. When the Holy Spirit came on Pentecost, He empowered Christians with gifts to share the Good News and build God's Kingdom. Then, as now, the Holy Spirit empowers Christians to live as Jesus taught and to share His Good News. Over time, many people had come to think that holiness and the gifts of the Holy Spirit were only for certain people. As a means of restoring the use of all of God's gifts throughout the Church, God has been renewing lives with the Holy Spirit through what has become known as the Catholic Charismatic Renewal. Around the year 33 AD, when Jesus ascended into Heaven, He told his disciples to wait in Jerusalem for "the promise of the Father," and that they would be, "baptized in the Holy Spirit" (Acts 1:4,5). For the next nine days they prayed together until the Holy Spirit came on the day of Pentecost. The Bible, in chapter two of the Book of Acts, records that when the Holy Spirit came to the early Christians on Pentecost, they received power to live as Christ taught and follow Him in a world hostile to His truth. They went out and told others about Jesus. As God touched hearts one by one, people decided to join the community of those who followed Jesus. The Church grew from a small and frightened group into the most miraculous and world-changing community in history. The Holy Spirit has continued to come to individuals who welcome Him throughout history. Although at times over the last 2,000 years the daily experience of Christians has not always shown the same outward display of passionate excitement, to renew and refresh the Church, the Lord continues to send His Holy Spirit. 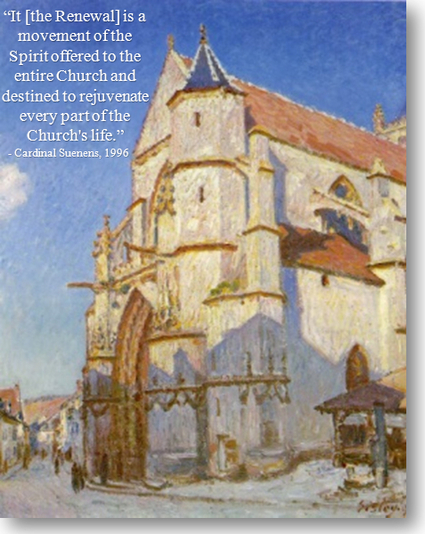 The charismatic renewal has a gift of continually bringing the Church back to its early passion. The Popes have recognized and supported this, encouraging a "culture of Pentecost." Towards the end of the 19th century, God began to plant the seeds that would grow into the present day charismatic renewal. From 1895 to 1903, Blessed Elena Guerra, foundress of the Oblate Sisters of The Holy Spirit in Italy, wrote 12 confidential letters to Pope Leo XIII, asking him to encourage greater devotion to the Holy Spirit among Catholics. In 1897, Pope Leo XIII published an encyclical about the Holy Spirit, called Divinium Illud Munus. He also called for the Church to pray the Novena for Pentecost at the beginning of the new century. A novena is a prayer said for nine days, which recalls how the early Christians prayed for the nine days between Christ's Ascension and the coming of the Holy Spirit on Pentecost. On January 1, 1901, Pope Leo XIII prayed to the Holy Spirit. 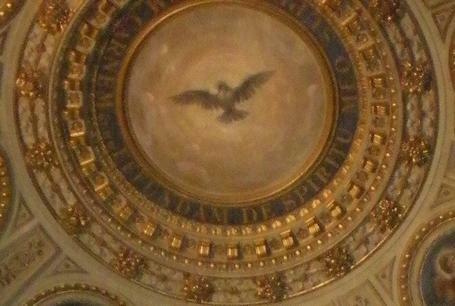 He sang the Veni Creator Spiritus by the Holy Spirit window in St. Peter's Basilica in Rome. That same day, in Topeka, Kansas, at the Bethel College and Bible School, the Holy Spirit came upon a group of Protestants who had been praying to receive the Holy Spirit as the early Church did in Acts chapter two. Agnes Ozman prayed in tongues, and people began to welcome the Holy Spirit to work in them as in the early Church with healings, miracles, deliverance, and power to effectively evangelize and help people convert to Jesus Christ. This beginning of the charismatic renewal highlights its ecumenical nature that continues to be experienced over 100 years later. The commonly shared experience of being filled with passion and love for God has been a major way that the charismatic renewal helps bring Catholics and Protestants together to build relationships and learn to recognize many common areas of Christian living. The historic events at the beginning of the charismatic renewal are significant for unity not only among individual Christians, but also for unity in the entire worldwide Church. As seen in this historic event, the Pope's prayers resulted in an outpouring of the Holy Spirit upon Protestants. This highlights how through the Pope, God gives a special gift of apostolic covering to all Christians. The Pope is able to minister on an international level in a way that even the most well-travelled evangelists do not experience. While most pastors minister on a local level, the Pope fills a need to minister to the whole Church on a worldwide level. Following the 1901 outpouring of the Holy Spirit, in 1906 a revival began on Azusa Street in Los Angeles, California. From here, word spread that people were experiencing God as on the day of Pentecost, and people came from near and far seeking to learn more about it. Pilgrims whose hearts were touched and filled anew with the Holy Spirit, also would experience Pentecost in their own lives, and go forth to share this with others. One of the main messages that the Second Vatican Council taught was the importance of the "universal call to holiness." Vatican II taught in Lumen Gentium chapter five that Jesus, "preached holiness of life to each and every one of His disciples of every condition," and that Jesus calls all Christians "to the fullness of the Christian life and to the perfection of charity." The Council further taught that Jesus gives both the call and the ability to fulfill it because Jesus, "sent the Holy Spirit upon all men that He might move them inwardly to love God with their whole heart and their whole soul, with all their mind and all their strength and that they might love each other as Christ loves them." Once the universal call to holiness was proclaimed by the Pope and the bishops, it was up to the people to respond to this call, and ask God for grace to fulfill it. Similar to the day of Pentecost, a group Catholic students from Duquesne University gathered for a retreat in 1967. They did not plan for what God would do during their retreat, but one evening while praying before the Blessed Sacrament, God simply sent them the gift of Baptism in the Holy Spirit; that is to say, they experienced a personal outpouring of the Holy Spirit. That event has become known as the Duquesne Weekend. As the people at that retreat shared their experience and prayed with people, from that day forward just as Pope Leo XIII prayed for, an outpouring like a "new Pentecost" spread throughout the Catholic Church. As more and more people discovered personal renewal and friendship with the Holy Spirit, they gathered in prayer groups and eventually held conferences and gatherings on local, national, and international levels. Charismatic communities developed, helping lay and religious live in the grace of the Baptism in the Holy Spirit, and providing a place where vocations, families, ministry, and the ecumenical journey towards unity flourish. As people grew in their understanding of what God was doing through this great outpouring of personal conversion and Church renewal, people began to speak of it as the "Catholic Charismatic Renewal." As time passed, the Holy Spirit continued to inspire new communities and movements. These may have diverse expressions of prayer, missions, and use various gifts. Though the charismatic renewal has similarities with movements, the charismatic renewal is unique in that it is not a structure with a founder, membership records, or a program; although within the Renewal there are groups that do, and there is concrete connection and fidelity to the Church's leadership in Rome and dioceses globally. Overall, the Renewal is a gift and an invitation available to all. It invites people to more fully experience the gift of the Holy Spirit. The charismatic renewal comes to the whole Church with the understanding of Baptism in the Holy Spirit as a grace intended for all, which assists - but does not replace - the movements. Baptism in the Holy Spirit facilitates personal conversion, and helps people use charisms to their fullest potential. Thus, the charismatic renewal is a gift to the entire Church. To help us get to this point of understanding within the charismatic renewal and this point of acceptance by the whole Church, wise and holy leaders everywhere from local parishes to the Vatican gave pastoral assistance and encouragement to those touched by the renewal, and guidance for those who were uncertain about it. Cardinal Suenens gave pastoral care to the renewal worldwide. Under his guidance, the renewal grew in its understanding of what the Holy Spirit was doing and where the charismatic experience fit within the context of the universal Church. Another leader was Cardinal Cordes, to whom the Pope wrote in 2009 about how the Church's leadership helped new communities and the charismatic renewal be welcomed in the heart of the Church. The Pope wrote, "While in the beginning the organizers and planners in the Church had many reservations in regard to the movements, you immediately sensed the life that burst forth from them — the power of the Holy Spirit that gives new paths and in unpredictable ways keeps the Church young. You recognized the pentecostal character of these movements and you worked passionately so that they would be welcomed by the Church's pastors." As the Church's pastors grew in understanding the charismatic renewal, and seeing the need of guidance that comes with rapid worldwide growth, in 1978 an office for the Charismatic Renewal was established in the Vatican. Known today as ICCRS, the International Catholic Charismatic Renewal Services, this office assists in the promotion of a "culture of Pentecost" throughout the Church. In 1997, the bishops of the United States issued Grace for the New Springtime a document on the charismatic renewal. They supported the renewal, encouraging "the whole Church to look into and embrace baptism in the Holy Spirit" as "part of the normal Christian life." The US bishops connected the renewal with helping people live the universal call to holiness, saying, "the impact of the Charismatic Renewal on the broader Church has been significant. The Renewal has nourished the call of all to holiness as a gift from the Spirit and helped the Church come to a greater awareness and expectancy of the Holy Spirit and the charismatic gifts of the Spirit. The Charismatic Renewal has led the people of God in a revival of the ministry of healing, encouraging them -- laity and clergy alike -- to pray for the sick with faith and expectancy. It has renewed the appreciation for the role of praise in individual and communal prayer and enriched the Church with many gifted musicians, music ministries, and song writers. The Renewal has taught a commitment to the Pope, the Bishops, and to orthodox teaching. Vocations to priesthood, diaconate, and religious life have been fostered. It has called forth the gifts of the laity who are today serving in a variety of ecclesial lay ministries; e.g., in the liturgy, religious education, and youth ministry, and ministries for the transformation of the world." Today, the renewal has spread to every continent, received the blessing of the Popes, and has refreshed souls in the Holy Spirit and by bringing people to Jesus, giving many a new start at life. People are healed physically, emotionally, and spiritually. It builds unity among Catholics and Protestants. The renewal has been a strong means of evangelization bringing people to experience the power and presence of God in a way that for them is new and deeper than what they previously understood. As the Holy Spirit comes and enables people to live an "abundant life" that Jesus said He would give (John 10:10), people are converted, and with newfound joy and peace, fall in love with Christ and His Church. Pope Francis came to a Catholic Charismatic Renewal conference in Rome, attended by around 50,000 people on June 1, 2014. He spoke to the crowd, praised God with them, and asked them to pray for him, which people did using the gift of tongues. He told the charismatics, "Thank you. I feel at home with you." Read more of what he said here. Pope Francis lifts his hands in praise and worship at 11:40 in this video of the conference, and at 20 minutes the people sing and pray in tongues. Read more at the Arlington Herald. ﻿﻿﻿﻿﻿Divinum Illud Munus - encyclical of Pope Leo XXIII, 1897, "On the Holy Spirit"
Pope John Paul II explains the prayer "Veni Creator Spiritus"
At the Turn of the 20th Century - about Blessed Elena Guerra and Pope Leo XIII. Agnes Ozman ﻿- Protestant lady in Kansas who prayed in tongues right after Pope Leo XIII prayed in Rome asking God for a renewed devotion to the Holy Spirit. Come, Holy Spirit! Fill the hearts of thy faithful, and enkindle in them the fire of Your love!